Hello! 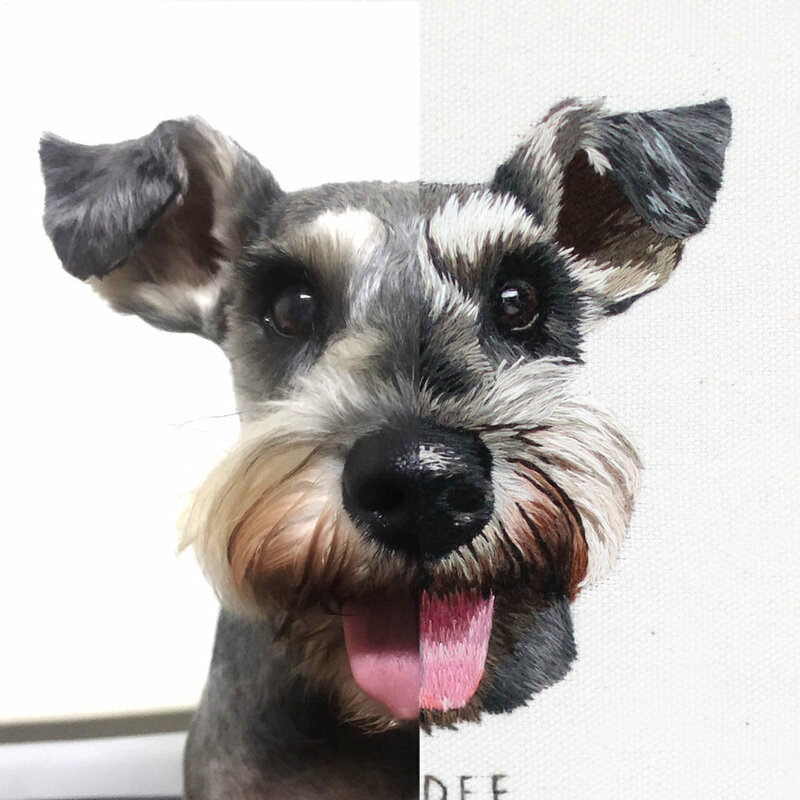 If you are on this page, then you’ve realised you would love to own a custom embroidered portrait of your beloved furry friend! Thank you for visiting this page and for considering me to embroider a custom pet portrait for you. If I haven’t been able to answer your questions via this page, or you have a commercial enquiry then please email me at info@emillie-ferris.com. Embroidery is a slow process, that requires many hours to complete just one hand-embroidered hoop, therefore as of 2019 I will be accepting pet portrait commissions primarily through a waiting list. This means that my old system of releasing slots first come, first serve will be taking a step back, and may only occur once a year. I believe having a waiting list system in place will be more suited to everyones busy lifestyles! The best things in life are worth waiting for, and I hope you can be patient with me whilst I embroider my way through as many portraits as I can this year. My embroideries are hand made completely by me. All of my pet portraits receive special attention and are created with patience, love and care. I am happy to post the embroideries worldwide. Stitched using DMC embroidery floss onto Cotton Calico Material. It’s extremely important that you can provide a high quality photo for your pet portrait. The better quality the photo, the better I will be able to capture all of those extra details that make your furry friend unique. It’s how I capture their personality! I embroider directly from one main photo for the composition, and if needed, use additional photos for colouring and details. When capturing your main photo, try to capture their main personality traits, for example: Is your pet a majestic goddess? photos of them looking slightly off camera and chin up can look especially regal! Is your pet a happy chappy? Be sure to capture their smile and sparkling eyes! Choose a high resolution photo taken with a digital camera or a mobile phone with a good camera. When you zoom in you want to be able to see their individual hairs! Take the photo in natural daylight so as to capture the colouring of their fur accurately. Fill the viewfinder with your pet as much as you can without distorting their features. Sign up to receive news and updates about upcoming first come, first serve commission openings, new original pieces, upcoming embroidery patterns and more… .